It’s more than just a motto. At Trident University, we give our students the power to make their education dreams come true on their own terms. With flexible, 100% online classes that can be attended at any time, the power to earn your degree and strive toward a brighter future is in your hands. For Military, Veterans, and Their Families. 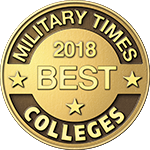 At Trident University we understand the unique needs of military, veterans and their family members. Receive credits for your years of leadership and professional experience in one of our military friendly programs. Trident University is the first fully online university regionally accredited by the WASC Senior College and University Commission (WSCUC). Regional Accreditation is recognized by many in higher education as the gold standard that validates the challenging and rewarding academics that make the Trident Learning Model so uniquely effective. Find out what’s happening this month at Trident University. Click below for our all-new News & Events page. New veterans & active duty service members benefit from The Definitive Guide to College for Veterans e-Book. Take control of your degree path with increased flexibility and graduate sooner by completing courses in 8-weeks. Learn more about our admissions requirements and discover all of the financing options and opportunities. Trident University is the first 100% online university accredited by WASC Senior College and University Commission (WSCUC). Regional accreditation is widely considered by experts as the gold standard and Trident shares this distinction with other top schools including Harvard, Berkeley, Stanford, USC, Notre Dame, San Diego State, UCLA and others.